SUP yoga?! What Do I Wear?! SUP is a cool way water enthusiasts shorten the term Stand Up Paddle AKA Paddleboarding. SUP Yoga involves the flow in and out of asanas (yoga postures) all while floating on top of a paddle board. Sounds fun right? I know, It is. 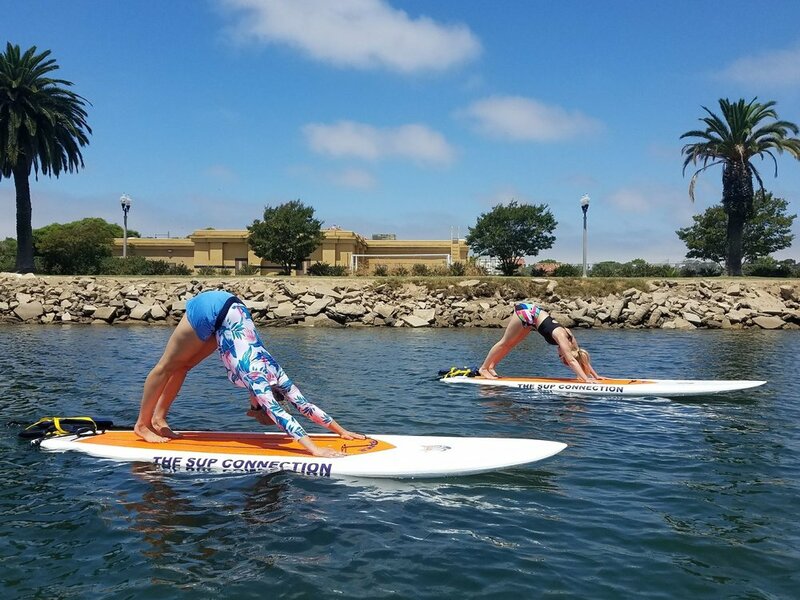 SUP Yoga with SunChaser SUP in San Diego, California. So what do I wear to a SUP Yoga class? This is a question we hear often. Don’t overthink it. Wear whatever is comfortable for you. There will be a lot of moving, bending, and stretching. Choose clothes that will enhance your movement rather than restrict it. Yoga Clothes: Because why not? We wear yoga clothes to hot yoga so why not wear them on the water. Wear dry wicking clothing that when wet doesn’t get heavy and drag you down. Dry Wicking fabrics pull moisture away from the body. Choose fabrics that are breathable and lightweight. Most of our yoga attire is made from Spandex, Nylon. Try to avoid cotton if you can. Cotton is (anti wicking) which means it absorbs moisture. When It gets saturated with your sweat or with water it gets heavy and weighs you down and on top of that cotton does not dry fast. No one likes soggy, heavy clothes when you are trying to do yoga. Some of our favorite brands to wear on the water are Wolven Threads and Liquido Active. They are super comfy and they dry fast! There really are so many brands offering comfortable, quick drying options for paddle yogis. What about swimsuits? We are on the water right? Swimsuits: Keep in mind you will do a lot of bending and stretching in your sup yoga classes! Ensure your suits are comfortable and your modesty needs are met. Swimsuits are at the discretion of the yogi, however not solely recommended. If you are taking a SUP yoga class in extremely warm climate try wearing a comfy sports bra and sport shorts. Rash guards: Rash guards can be described as an athletic shirt made of a spandex and nylon blend. Rash Guards are great because they can add a layer of warmth, comfort, and skin protection. Today you can find ones that offer SPF for extra skin care. We like them beacause as SUP instructors living in San Diego, we are in the sun alot, rash guards are light and easy to layer. Check out Athleta, they make some fun style rash guards. Eyewear: Leave the expensive pair of shades on shore! We suggest grabbing an old or inexpensive pair to wear while you paddle. They can sometimes be distracting if they are not a good fit so keep that in mind. If you wear them while you paddle be sure to have a safe place to put them during the yoga class if they are not a secure fit or you can also grab for a pair of straps to hold your glasses on if you need to wear them out. Sunscreen: Protect your skin! As much as we love chasing the sun safety first! Nothing can ruin your day more than a sunburn. Choose a sunscreen that is water resistant and preferably environmentally safe (reef safe). Some examples we love are: RAW love, Badger, and Sunbum. Dana, the founder of SunChaser SUP loves Badger natural sunscreens, where as Kayla, our Co-founder loves Alba. With so many options on the market, make sure you do a little research into the best ingredients to protect your skin. Hats: Hats add an extra layer of protection but can sometimes get in the way for yoga. If you choose to wear a hat on the water be sure to have a way to secure it to the board or that it fits snuggly to your head. Contrary to popular belief wetsuits won’t actually help you in SUP Yoga. Why? 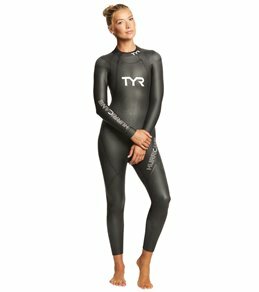 Because wetsuits only work properly when you remain wet. In SUP yoga although you have a chance of falling you do not stay wet the entire time. So wearing a dry wetsuit on the dry surface of a paddleboard will actually make you really hot. Then the opposite happens when you wear a wet wetsuit on the dry surface of the board, as the suit dries by evaporation this releases heat from the body and you get really cold. And lastly, wetsuits are really bulky and inhibit your ability to move freely! In summary: don’t overthink it. Going out to buy something just for a yoga class is not necessary, but we hope from the tips mentioned above you will be able to utilize something you already have, or if you find a passion for the sport like we do we hope we could help you make some informed purchases!